The Resistance Movement against Trump has been powerful — but how do we keep it going? We are in the midst of one of the largest social movements of our time, with record numbers engaged after decades of demobilization. The Women’s March was the largest single day of protest in American history, with about four million people participating. To help the tens of thousands of people who are eager to resist Trump, we’ve developed Resistance Guide, a short handbook with the analysis, skills, and tools to sustain a resistance powerful enough to win. Erica Chenoweth, a leading scholar in the field of civil resistance, has collected data showing that nearly every month since Trump’s inauguration, there have been thousands of protests involving millions of people across the country. We have witnessed an emergence of activity around the fight against the Republican assault on healthcare, the repeal of DACA, the Muslim ban, the surge of white supremacy in Charlottesville, and the United States’ departure from the leading global climate change accords. 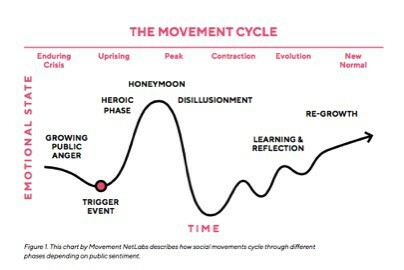 Over the last three years of working with the Momentum training program to train thousands of activists and organizers in how to build people-powered movements, based on lessons gathered from the field of civil resistance, one thing has become very clear— movements move in cycles. This means that the majority of movements typically go through periods of a great surge of activity followed by a downturn of low engagement in which individuals within the movement feel a great sense of disillusionment or despair. We call this phenomenon the cycle of momentum and it can teach us a lot about how to sustain movements through both periods of boom and bust. Almost two years ago, Paul wrote a book called This is an Uprising about what makes or breaks social movements like this. In the wake of the election of Trump, we realized that we needed something more accessible to provide people with an understanding of how movements work and how we can use this knowledge to sustain the current resistance. 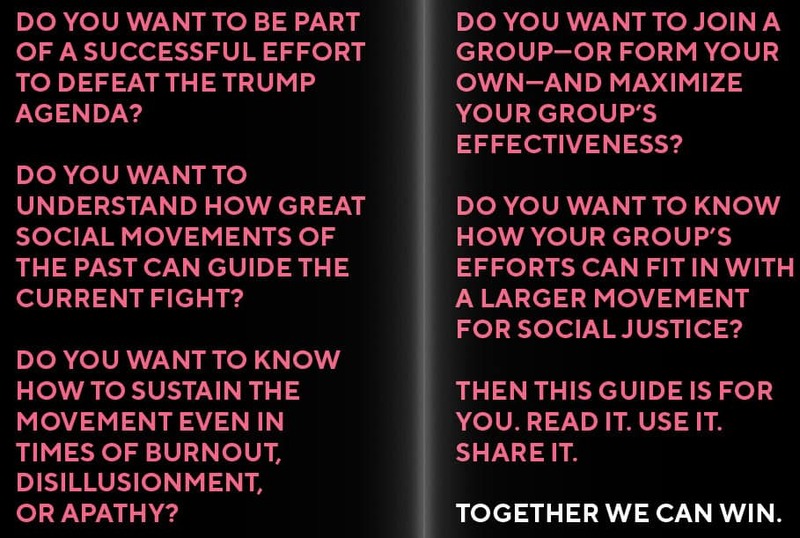 For this reason, we’ve developed Resistance Guide, a short handbook that can equip tens of thousands of people who are eager to resist Trump with analysis, skills, and tools to help sustain a resistance powerful enough to win. 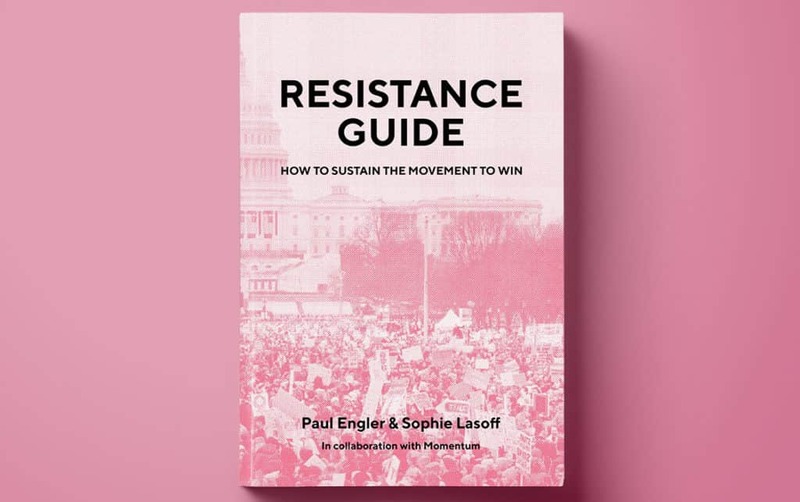 The guide will be available as a book for purchase as well as for free online, so that it can be shared widely amongst people already participating in the resistance movement and looking to join. There are times when movements explode — like in Charlottesville, at the Women’s March, or at the airport protests. We call these explosive moments “trigger events.” During these times, the movement is in the media spotlight and hundreds of thousands of people become temporarily interested in the movement. New people become activated and massive amounts of protest activity happens without central command. Trigger events are critical for social movements – by generating huge public engagement and attention, they quickly shift public dialogue and consciousness around an issue. Throughout history, most social movements have been born from these kinds of moments. But they do not last. And one trigger event rarely leads to sweeping victory. The movement has to sustain itself through multiple cycles of momentum to gain enough support to win. Without an understanding of these cycles, when the momentum dies down and the activity slows, participants experience a loss of community, a temporary loss of power, a lack of unity about what to do, and a feeling of hopelessness. It is important to know that we can create more trigger events in the future – and how. When we are in the down cycle, we need to keep hope of the movement alive and teach people that it is a natural part of any successful social movement. It’s a key time to focus on building the foundation, organization, and leadership for the long haul and prepare for the next trigger event. Ivan Marovic, one of the founders and leaders of Otpor, a student movement in Serbia which overthrew the country’s dictator in the 1900’s, has shared with us that the majority of internal conflict in Otpor came from disagreements within the movement about how social change is actually achieved. While Otpor trained its leaders in the the idea that change comes from the active involvement of a critical mass of people in a social movement, some members of the movement pushed against this theory of change. This sense of ambiguity around the power of people to change the status quo is not uncommon. This doubt in the impact of social movements is not uncommon. The mass media and history books are constantly telling us that real change happens through established politicians or billionaires with power and influence. However, studies in civil resistance say that regime change happens not because of these elite power brokers, but by social movements that involve a critical mass of people. Erica Chenoweth shows through her immense statistical database of movements that have overthrown dictators, that all those movements have succeeded if they reach sustained, active participation of at least 3.5 percent of the population. The historian and sociologist Frances Fox Piven, one of the great social movement theorists of our time, was able to trace almost every single major egalitarian reform in American history— the end of slavery, women’s suffrage, and labor rights, to name a few— to social movements who used this same theory of change. Active participation of people to disrupt business as usual, to protest, and to change the political weather can make what once seemed impossible, possible. Having faith in this theory of social change is what makes movements possible. People will only make sacrifices if they truly believe that their efforts will collectively amount to significant change. When we do trainings with hundreds of different organizers and activists from many different movements, we do a workshop called social movement ecology. We have people identify the type of resistance they and their organization primarily function within. The three major ones in the resistance movement that we’ve broadly defined are: game change, the outside game, and the inside game. Most people identify with one type of resistance and deeply understand that each type has strengths and weaknesses. But you would never know that if you looked at most coalition meetings. Many of us can fall into the trap of critiquing other types of resistance, instead of appreciating their differences and figuring out a strategy that supports each type. Unfortunately, the conservative Tea Party, had an incredibly effective collaboration between these three types of resistance, making them very effective at blocking progressive social change. We can learn a lot from them. Already, resistance groups are playing essential roles in each type of resistance. Like the Tea Party, we need a strategy that includes and appreciates them all. Appreciating and supporting each type of resistance and understanding its role in a larger social movement ecology allows the movement to not only build pressure from multiple angles but also to sustain itself through multiple cycles of momentum. It’s critical to use and advocate for a theory of social change that supports each type of resistance and defend each other against criticism and attack from people who don’t believe in social movements. This allows us to have better collaboration and appreciation for the role each organization and each person can play in the movement. To learn more about these tips, you can purchase or download the Resistance Guide. Explore it online for free, buy a printed copy at Amazon or on our Facebook page. For a deeper understanding of the theory of civil resistance behind the guide, read the new paperback edition of This is an Uprising.